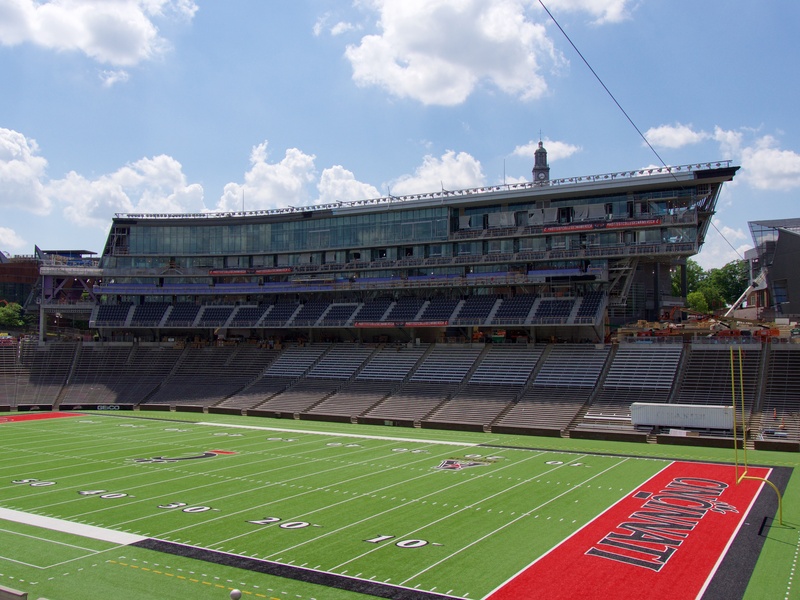 The $86 million renovation and expansion of the University of Cincinnati’s historic Nippert Stadium is nearly complete. According to project officials, the work is expected to be complete in time for the Bearcats to host their first game back on campus – after a year away at Paul Brown Stadium – in three months. The latest project video update reveals that virtually all exterior work is now complete, and that crews are now focused on interior finishings, along with some exterior facade treatments. They also note that the dramatic roll-open windows on the press boxes will soon go in, along with the ribbon scoreboards on both the east and west sides of the 114-year-old stadium. Designed by New York-based Architecture Research Office and Heery International, the modern architectural style continues a trend on UC’s main campus of blending contemporary with historic designs. The large glass facade on the back side of the western concourse will, perhaps, serve as the best example of this as it looms over the historic, yet modern Tangeman University Center and internationally acclaimed UC Main Street. The new Nippert Stadium will have an increased seating capacity of 40,000, and boast luxury boxes, press suites, new lounges, and a sorely needed expanded offering of restrooms and concessions stalls. Originally projected to cost between $80-85 million, University officials say that the $86 million project is being funded through private donations and premium seat revenues.